In a Hidden Path Learning Task, subjects have to explore a grid or labyrinth to find a pathway from point A to point B. Typically, the path starts in the upper left corner and end in the lower right corner. For psychometric testing, searching for a hidden path in an unconstrained NxN grid became the preferred method over labyrinth testing in which subjects must find a pathway through a set of walls. In the unconstrained version (no walls) a path is invisible and a subject must move a marker step by step exploring the fields surrounding the current location to find the next valid tile of the pathway. The characteristics of the path can be set by varying the length of the path (steps), the number of turns, and the distance between the start and end point. For each step, the subject can choose between three possible directions (straight, left, or right) as long as no boundary conditions constrain those moves. As a general rule, diagonal moves and jump moves to fields further apart from the current fields are not allowed. A pathway should always keep a distance of one field to itself, so that fields to not directly touch eachother. These rules limit the possible choices as the subject moves on. When the subject tries a valid field but the field is in the wrong direction, this is called an exploratory error. The theoretical maximum number of exploratory errors for a given path depends on how many direction are blocked by the pathway itself or by touching borders of the maze. Hidden pathway learning tasks have been used in neuropsychological research and practice for more than 80 years for studying exploratory and goal-oriented behaviors, and later as an experimental tool in neuropsychology(Thomas et al. 2014, Papp et al. 2011). The task paradigm has been originally described by Barker (1931) and Milner (1965). It has a strong executive component since subjects must make decisions, follow rules, and may learn heuristics to predict the path when it is approaching the end point. By repeating the same path pattern several times, visuo-spatial memory can be tested. Correspondingly, this test is sensitive to neurological disorders that affect exploratory goal-oriented behavior and implicit learning. 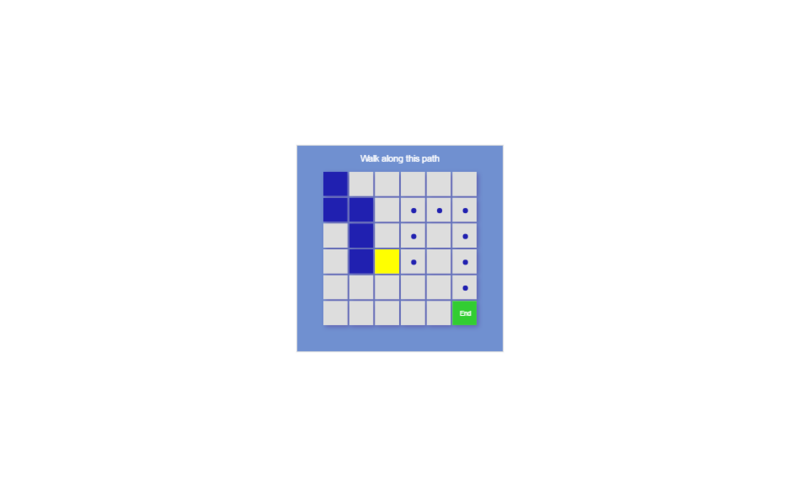 The computerized version of the The Groton Maze Learning Task has been widely used as an neuropsychological test in clinical trials and was specifically sensitive to Alzheimer-related cognitive deficits (Pietraz et al., 2008). This implementation of the hidden path learning test offers many configurations options to realize different flavors and complexity levels of the hidden path learning paradigm. You can vary grid size, path characteristics, and hints about path depending on your patient profile and research objectives. To measure subject’s ability of anticipating the path, a new orientation index is introduced that counts the number of exploratory errors relative to the number of possible errors. In theory, each step is a point of choice to go in one of three directions. But this number of choices is reduced when the current field is attached to the border of the grid or a field would touch the tail of the path. Consequently, the sum of all choices for a given path is not only related to the number of steps but also to the shape and position of the path. The orientation index takes this into account by computing the percentage of exploratory errors relative to the number of possible exploratory errors. The percentage is inversed so that 100% reflects perfect performance and 0% indicates that all possible exploratory errors have been made. This orientation index is more robust than just counting the number of exploration errors when comparing different path length or shapes. In addition, the number of rule violations are recorded to measures the ability to adhere to simple rules which is usually not a problem in healthy subjects but observed in schizophrenic patients. Thomas E, Snyder PJ, Pietrzak RH, Maruff P. (2014). Behavior at the choice point: decision making in hidden pathway maze learning. Neuropsychol Rev. ; 24(4), 514-36. Pietrzak, R. H., Maruff, P., Mayes, L. C., Roman, S. A., Sosa, J. A., & Snyder, P. J. (2008). An examination of the construct validity and factor structure of the Groton Maze Learning Test, a new measure of spatial working memory, learning efficiency, and error monitoring. Archives of Clinical Neuropsychology, 23(4), 433–445. doi:10.1016/j.acn.2008.03.002. bilateral hippocampal, bilateral frontal, and unilateral cerebral lesions. apparatus. Journal of General Psychology, 5, 280–285.